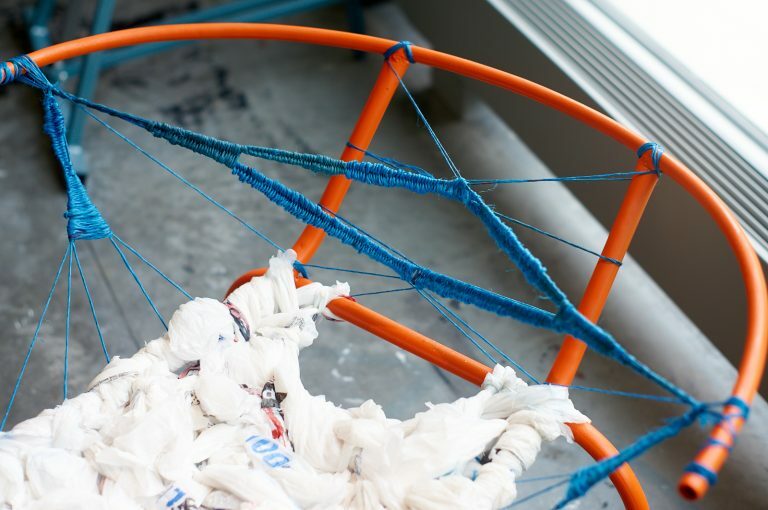 As she begins work on CYCLIC, her senior research project funded by a Benenson Award, Adair Jones reflects on three fruitful years at the heart of Duke's visual arts community. 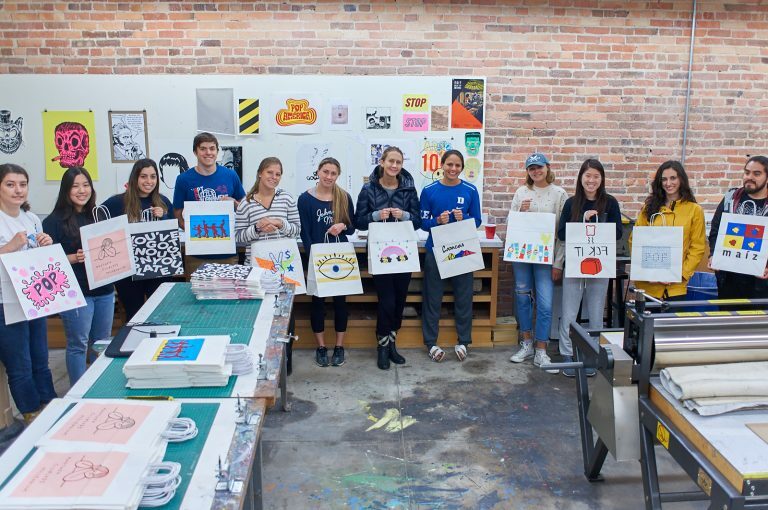 Duke students might know one of Adair Jones’s (Class of 2019) designs without even realizing it—she is behind this year’s retro-inspired Mural Durham: Satellite Park poster. 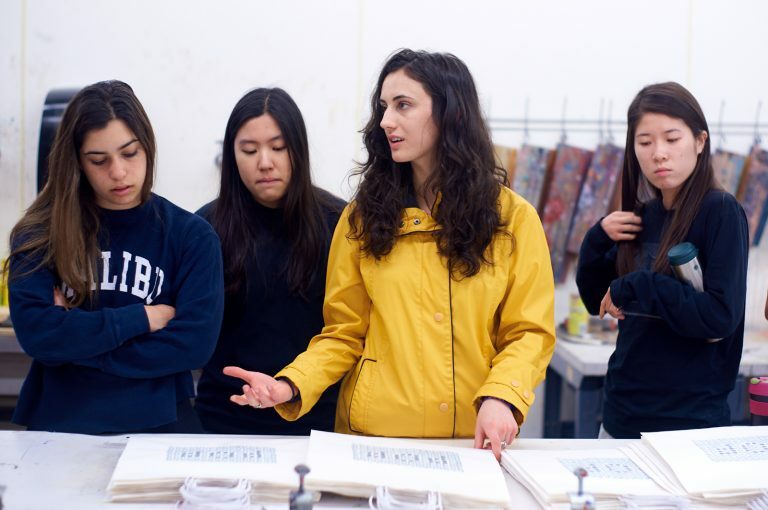 While at Duke, Adair has made a point to be involved with as many arts initiatives as possible. 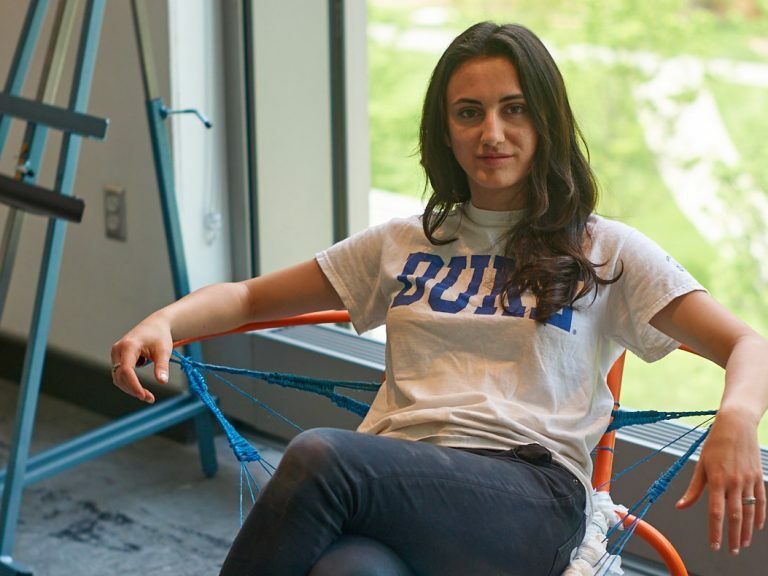 She is double majoring in Art History and Visual Studies, she is a member of the Nasher MUSE student advisory council, she joined the first cohort of Creative Arts Student Teams (CASTs) for the Rubenstein Arts Center, and she also helps support the Duke Coffeehouse. I sat down with Adair to learn about her experiences with the arts at Duke, and what she hopes to accomplish during her senior year and beyond. Jones in the Ruby's painting and drawing studio, in the first piece made for CYCLIC, her senior project. All photos by Robert Zimmerman. Three posters designed by Jones for public events at Duke. 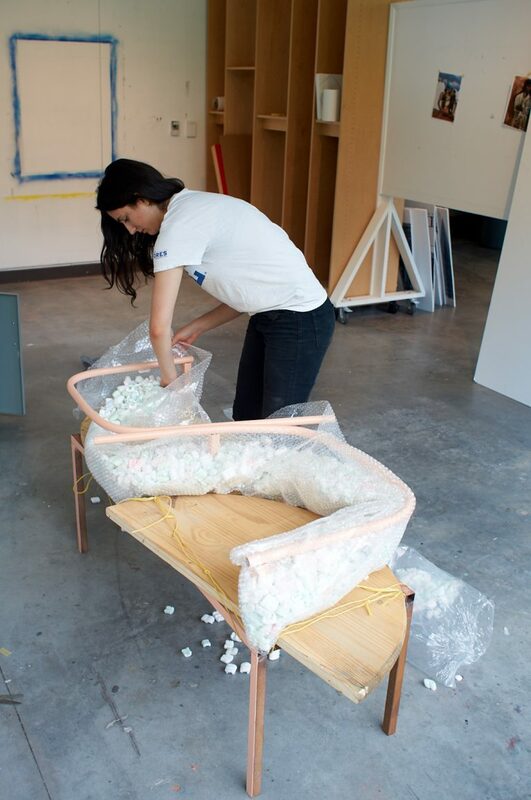 Cameron Oglesby (CO): What are the primary mediums that you work with as an artist? Adair Jones (AJ): Before coming to Duke, I did a lot of acrylic on canvas and also pencil drawings, like portraiture. 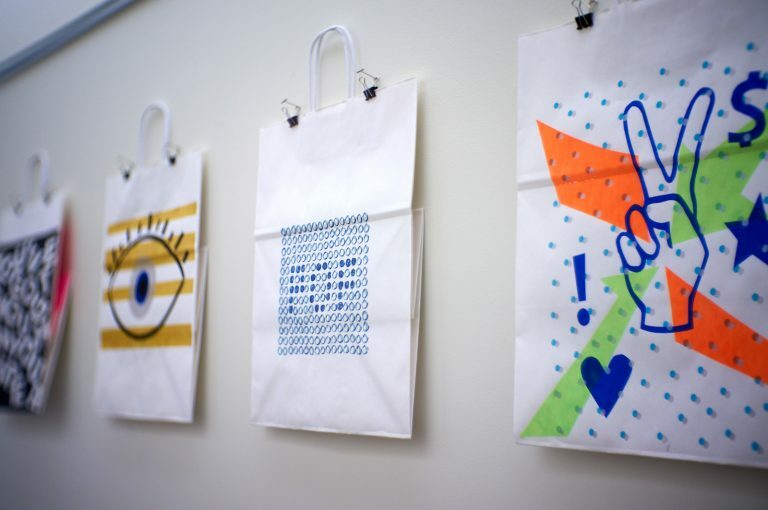 While at Duke I’ve taken a lot of screen printing classes and I’ve gotten into Adobe Illustrator. When I started making posters for the Coffeehouse I had never used Illustrator before—I taught myself the program over the course of these few years. Most of the work I do now is actually in Illustrator simply because on campus there’s not a lot of space to get paints—but you can bring your computer anywhere. CO: What about your background made you interested in the arts in the first place? AJ: Growing up I was always the “arts kid.” It was a part of my identity. So when I came to Duke, it just made sense to continue in the visual arts. It also made sense for me to major in art history because I didn’t know anything about it. Growing up, people would ask me, “Who is your favorite artist?,” and I didn’t know anyone! I felt like that was a necessary thing to acquire—the knowledge of past artists. 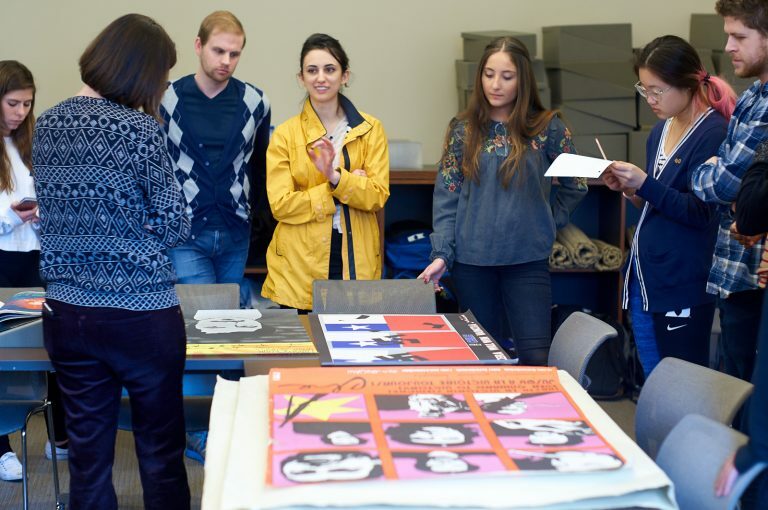 Students in Esther Gabara’s Spring 2018 Pop Art in the Americas class met in the Doug and Elise Beckstett Classroom of Rubenstein Library to view a selection of posters from the Bobbye Ortiz Papers. 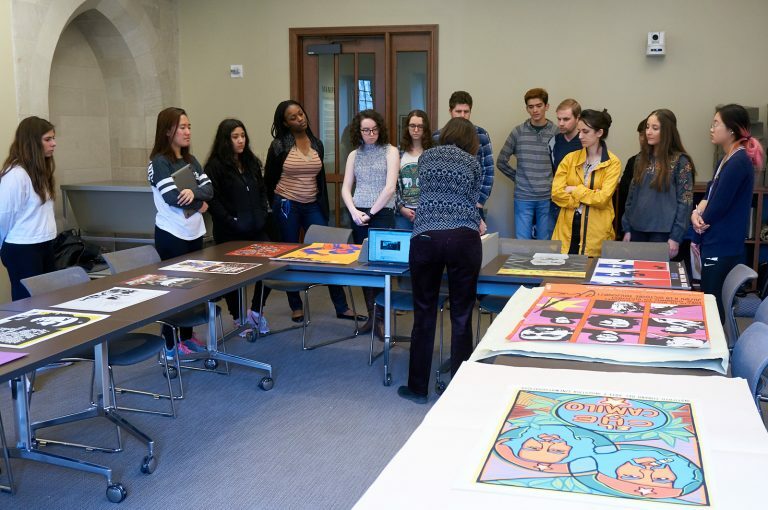 Three courses offered in Spring 2018 were connected to an exhibition of Latin American Pop art currently under development for the Nasher Museum. CO: What have you appreciated about your experience with the arts at Duke so far? CO: Similarly, what else do you hope to get out of your artistic experience for the remainder of your time at Duke? AJ: I’m planning on doing a visual arts thesis next semester. That will be a collaborative project within the department. I’m actually starting to work on it this summer because I got funding from a Benenson Award in the Arts to get started on my project. CO: Is there a type of art that you prefer to create? Such as realistic vs. abstract or landscapes vs. portraits? AJ: I love art in public spaces. That tends to be an installation or some type of sculpture. There’s this whole thing called land art that I’m obsessed with. I really like the nontraditional art that has a hard time existing within a gallery space. There’s also the division in art between art that can be commodified and sold and art that can’t be commodified or sold. I like artworks that cannot be sold; they are more accessible that way. 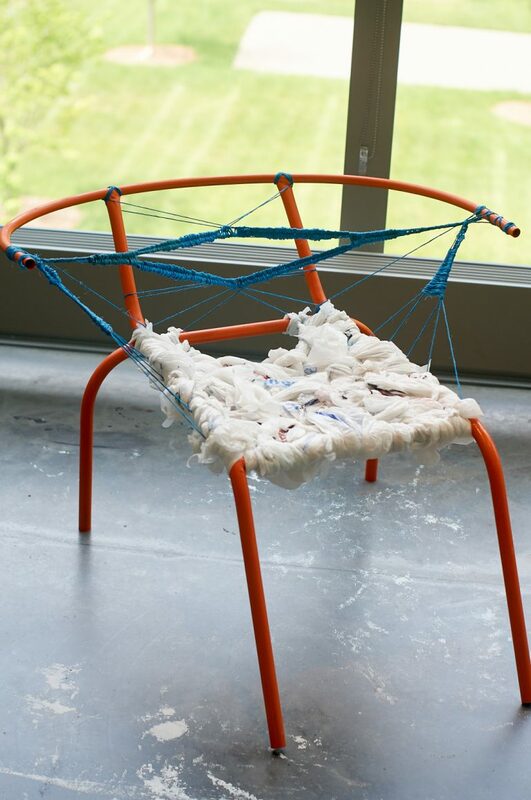 Jones constructed this chair using reclaimed twine, metal tubing, and plastic bags for CYCLIC. CO: What are your future plans, career wise or otherwise, with respect to the arts on campus or in life? AJ: I want art to always be in my life, but I don’t want it to be the focus of my career because I feel like that would take some of the fun out of it. I also feel like I wouldn’t make genuine art anymore—but I will always make art on the side and I want to make art for free, as a hobby. I just want to make it for my enjoyment and for the enjoyment of others—pro–bono all the way! On campus, I can think of three things that I would say I’m planning on. I work at Duke Coffeehouse and there’s a little wall that needs a new mural. As far as my thesis goes, I plan on having an exhibit at the end of my senior year that will be an interactive experience for students. 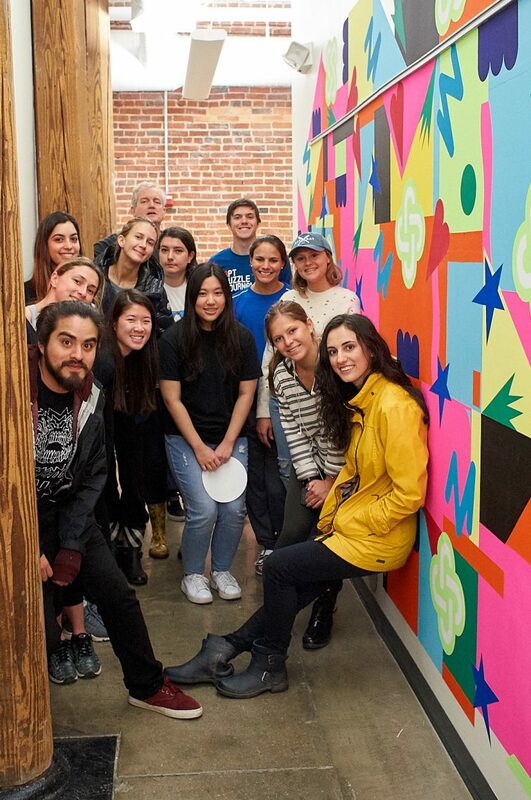 I’m also hoping to get more involved with duARTS and their programming. 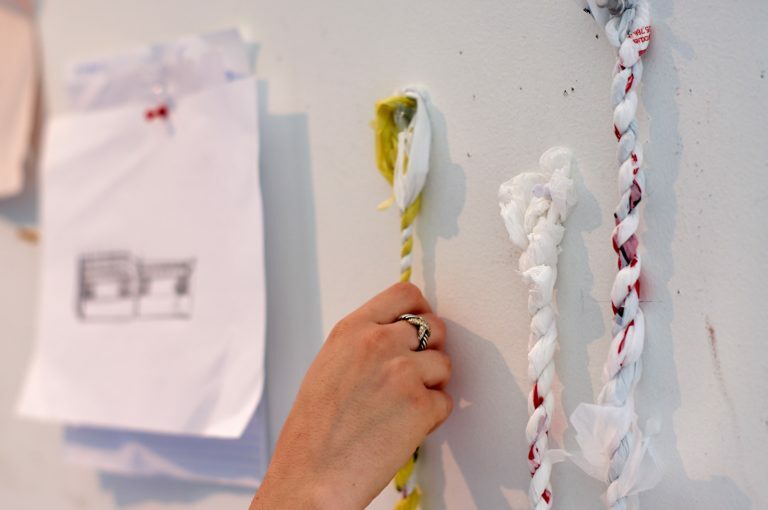 CO: Is there anything else you would like to share about your art experience at Duke or how it’s affected you? AJ: Duke stresses its interdisciplinary aspect and that’s definitely helped me. I find myself, while working on art projects, taking inspiration from classes in other departments—it’s all very collaborative. I might pull from my natural science elective, or a comp-sci class, or a history course. I’m glad I came to Duke rather than an art school for this reason. I’ve been exposed to random, non-art related subjects and topics that have proven foundational to how I approach and contextualize art. Cameron Oglesby (Class of 2021) is planning to major in Environmental Science with a focus in Ecology and double minor in Earth and Ocean Sciences and Studio Arts. 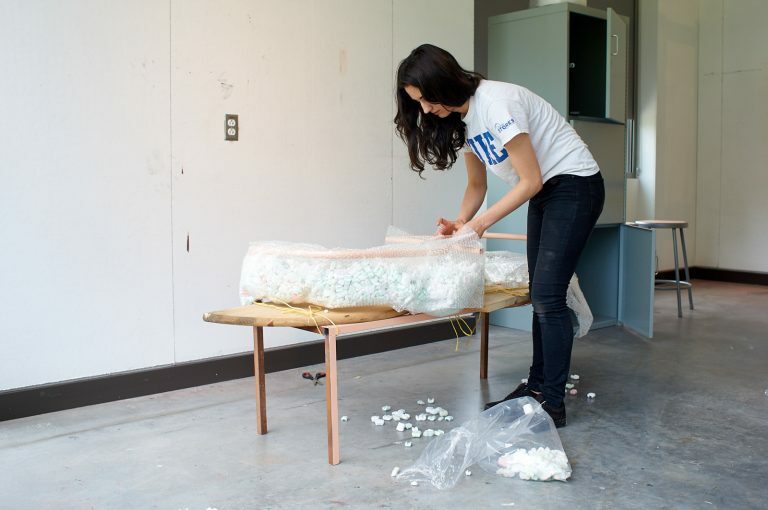 She believes art can send a message and be a call-to-action, especially as it relates to the importance of environmental awareness and ecological preservation and conservation. Next year, Cameron will continue her work in planetary protection as President of Duke’s Environmental Alliance and her work in artistic expression as Co-Vice President of Programming for duARTS.